People speed in school zones and put kids at risk. Studies show that lowering speed can reduce fatality rates by up to 40 percent and a very recent analysis by the National Transportation Safety Board concluded that speed is a contributing factor in fatal crashes at about the same frequency as drunk driving. Something has to be done, and you can be part of the solution. One way to reduce speed in a school zone is by installing speed bumps. Parents at my high school in Howard County, Maryland petitioned for and successfully won a campaign to place speed bumps on the road which connects to our drop-off and pickup locations. Speed bumps are one of the most effective options because they are proven to work, easy to install, and cost-efficient. Cement speed bumps cost an average of $4,500 to $7,500, but newer plastic versions can be even cheaper, ranging up to $950. While speed bumps worked for my school zone, another option might work better for your child’s school. For example, in Atlanta, Georgia, Safe Kids worked with FedEx on a project to improve the school zone at Inman Middle School. In addition to other activities, the project included the installation of flashing lights above crosswalks, which a child can activate by pressing a button to alert drivers that he or she will be walking across. You might find the idea of “lobbying” to be intimidating. Don’t let that stop you—in fact, our Founding Fathers empowered us to lobby our government in the First Amendment of the Constitution. As an intern at Safe Kids this past summer, I used my First Amendment right as part of a team that went to Capitol Hill to lobby Representatives and Senators from California about a variety of issues pertaining to children’s health. They were more than willing to talk to us, and try to work with us, because they agree protecting children is a top priority. Safe Kids created a Take Action Toolkit: How to Fax an Unsafe School Zone to help lobbying for smart public policy easy for you. It starts with a virtual map of an imaginary school zone with six danger areas, for example a dysfunctional drop-off, pickup area, or a street where drivers habitually speed—risky situations which could be improved with “traffic calming” measures. The first step is clicking on the school zone risk area that you think can benefit from changes in policy or infrastructure. That will open up to a very detailed, but easy-to-follow action plan to start to make change. Safe Kids action plans have model letters, sample social media posts, relevant facts and much more. This fact in the action plan can help you make the change that we worked on in Atlanta: Installing lighted crossing signs have a 78 percent success rate in encouraging cars to yield to pedestrians. 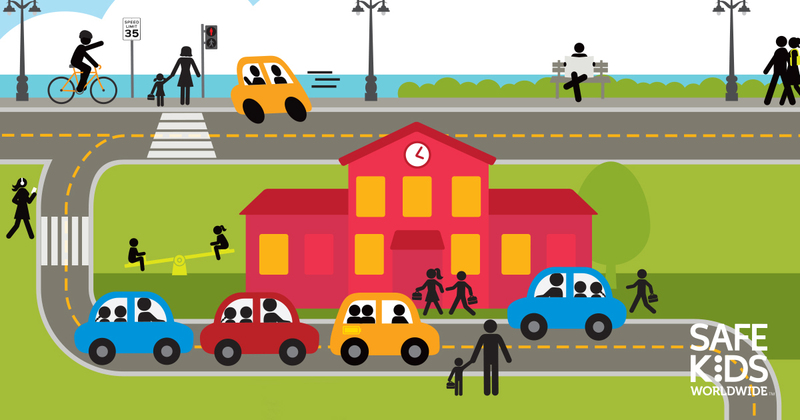 You can go directly to the Sensible School Traffic Action Plan and get to work. The Take Action Toolkit: How to Fax an Unsafe School Zone was sponsored by FedEx.